Welcome to our home "Fraser Jewels"
Situated at Eurong Second Valley, a perfect position to explore all areas of Fraser Island. Our home is a 3 level house with open plan living and large decks. Upstairs enjoy the spacious living area with flat screen TV, comfortable lounges and large dining table. Our kitchen is fully equipped with all modern appliances; oven, gas cook top, dishwasher, fridge, microwave, kettle and toaster. Enjoy the views from the large deck, with outdoor dining table and sun-lounge. Bedroom three has two single beds. The family bathroom, with bath is also on this level as is the laundry with washing machine and dryer. The home also has a single undercover car park with additional parking available. Storage space for recreational equipment is also undercover. blankets, mattress and pillow protectors and doonas for each bed. Linen (sheets and towels) can be provided at an extra charge. We also provide basic kitchen consumables such as dishwasher tablets, dish washing liquid, spray and wipe, foil, plastic wrap and baking paper. As guests, we ask that you leave our home in the same clean state that you found it. All cleaning aids and products are provided for your use. The complex is protected by a dingo proof fence. Fraser Jewels is centrally located at Eurong Second Valley on the Pacific Ocean side of the island. Stroll northwards up the beach to the restaurant or to the bakery for a coffee. Fuel is also available at the well stocked general store. Eurong provides easy access to all the island has to offer. Endless beaches for fishing or play. Or take the inland tracks and spend the day exploring the many pristine lakes and World Heritage listed forests. John and Jacky and family have spent many years enjoying their home and the island. It is truly a special place. This home is special to us, its our family holiday home with precious memories, not just an investment property. Our home has ocean views from the top level and its position ensures it takes advantage of the sea breezes. Our home has beautiful ocean views from the top floor living areas and large deck. Our home operates as a self clean rental with all cleaning aids provided. A beautiful home away from home. Jacky and John have the most beautiful home. Located within a dingo proof fence, with a gorgeous pool, bbq facilities and a children's playground this home has everything you could possibly need. I have never stayed in such a well equipped home, there is every kitchen utensil, fry pans, baking needs, dishwasher, oven, microwave, massive fridge, ikea cutlery (that I'm envious for!)! Honestly do not bring a thing it is all there. On the upper level is the kitchen, dinning, lounge, deck and a toilet, second level has three bedrooms, master has ensuite king bed tv and another deck, second room has a queen bed and tv and third room has two single beds. Huge family bathroom with tub and very well equipped laundry. Bottom level is another sitting area and space for two cars. Proximity to Eurong is less and 2 minutes. Caretakers at the property are lovely and made sure the pool area was perfect. We cannot fault Jacky and John's home it is perfect in everyway and we cannot wait to return. 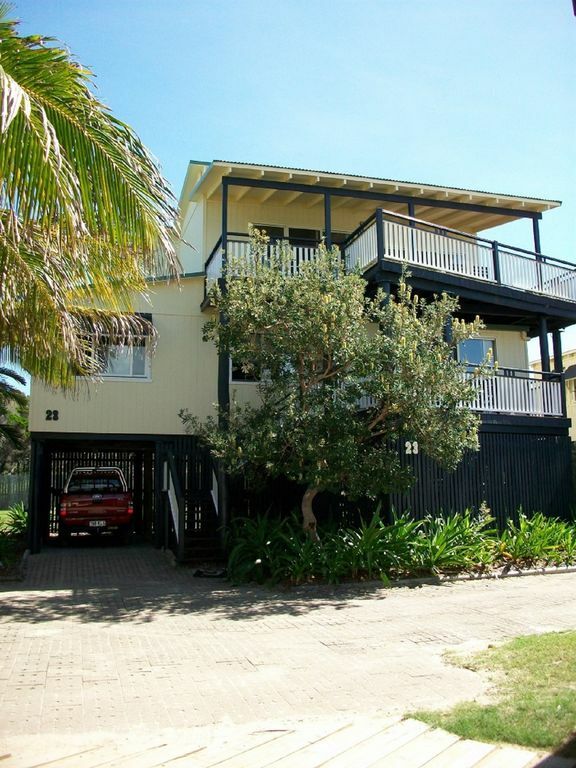 If you are looking for somewhere luxurious to stay when travelling to Fraser Island look no further than Fraser Jewels. Jacky's contact could not be faulted she emailed us maps, directions and kept in contact about check in and check out. Such a lovely person! Thank you Jacky and John!! Thank you Letittia for your lovely comments about our home, it is our aim to make sure it has everything you need for an enjoyable stay. We appreciate your care and cleaning it so well on departure and we look forward to you and your friends staying with us again in the future. We loved staying in the house, all the kids loved it and it suited young children well. My family and I loved the house , it is in a great location , is clean and tidy and has everything you need . We loved going to lake Mackenzie and Indian head . It's always wonderful to hear that our guests had a great time on this beautiful island. We hope you return soon. Magnificent on arrival, during our stay & even sad to leave. The website explains exactly what is available but seeing, experiencing and believing takes it up a few more notches. This home is spectacular. Where to start. Comfortable, quiet and an oasis from the island activities. It’s so warm and cosy to return to every day. Nights are quiet. Views are beautiful from the upper deck. As we said how could this get any better - then cue the whales! What a great stay. Highly recommended and still provides value for the family. Great to hear that you enjoyed your stay and thanks to the whales for turning up on time. Perfect house, perfect location. It's a gem! Our background: an extended family holiday with 3 generations (6adults) staying at Fraser Jewels for 6 nights. The youngest guest was 12months old and oldest members of the party were in the early 60's. Two 4wd vehicles as part of the group on our first trip to Fraser. - fantastic house layout. There is a single carpark under the house and enough space for another vehicle to be parked behind it. Up the stairs & on the first floor there are 3 generous sized bedrooms including a massive master with an ensuite (plenty of room for our portacot for bub), a common bathroom, separate toilet, separate laundry with washer & dryer. Then you go up another flight of stairs to the top level and there's yet another toilet (so you dont have to go downstairs), a beautiful loungeroom with two HUGE 3 seater couches which means there is plenty of space for all guests to sit, a huge deck looking out to the beach and a kitchen which had absolutely everything we needed to prepare and cook meals - nothing missing. The fridge was big so we could store our cold food supplies for the week easily (we had frozen some of our meat so that was easy to store in freezer too). - great location in a well looked after complex. Just a short walk or 60 second drive north to Eurong for supplies if you need them. Good location for accessing inland lakes too. The complex's pool is just lovely. There are 3 BBQs by the pool to use too. There is a little playground in the complex for kids and a grassy area with a hose to give your car a wash or rinse if needed. - owners are lovely. Jacky gave me a call when I requested the booking so that was fabulous to touch base over the phone rather than just email. The house is well stocked with cleaning products plus bits & bobs in the kitchen such as glad wrap. Jacky was genuinely concerned about us having a wonderful time and her care was appreciated. It is a special place for Jacky & her family and Fraser Jewels was a special and perfect place for our first stay on Fraser Island. - the house is in Eurong Second Valley. It is just south of Eurong. Takes 30min approx from Mantaray Barge at Inskip Point. Danielle, we are delighted to hear that your first visit to Fraser Island was such a positive experience. It really is a magical place. We enjoyed having your and your family stay and thank you for the respect you have shown to our home. Looking forward to having you stay again soon. Our home is situated at Eurong Second Valley on Fraser Island. The complex has its own pool, heated spa, BBQ areas and playground. Situated 300 meters from the Eurong township with a bakery, general store and fuel supplies. There is a restaurant at the Eurong Resort. The location allows for easy access to the Eastern Beach and all its attractions as well as access to the inland tracks to the lakes and rainforests.